When we say football, it could either refer to European football otherwise known as soccer, or American football that’s being played by the NFL. In this article, we will be talking specifically about the football that involves quarterbacks and tackling, the American version of football. If I were to describe this sport in a single word, that word would be intense. Why? Because the sport really is intense in a physical way, and this is one factor that makes football exciting. You can also read multipurpose event ticket templates. 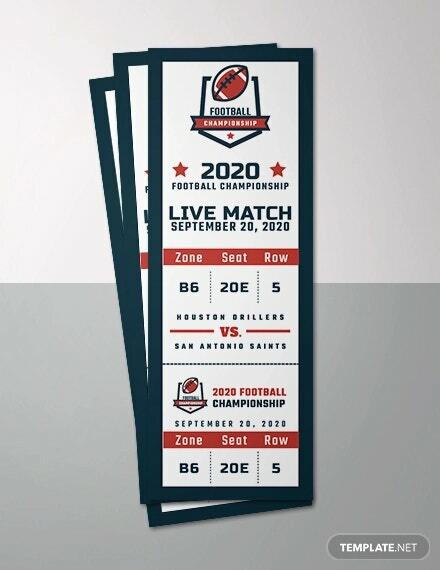 While the national league already has their own trademarked design for their tickets, you might want to make your own design if you are organizing a football event. 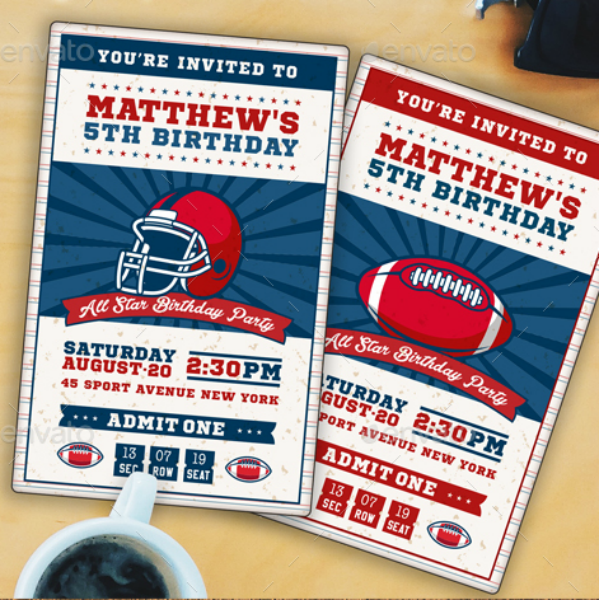 But your purpose for designing your own tickets may be different than we have mentioned, you may want to use it for a simple football-themed birthday party or any type of event. If that is the case, then you are very much welcome to use any of the football event ticket templates that we have for you below. You may also see ticket templates. 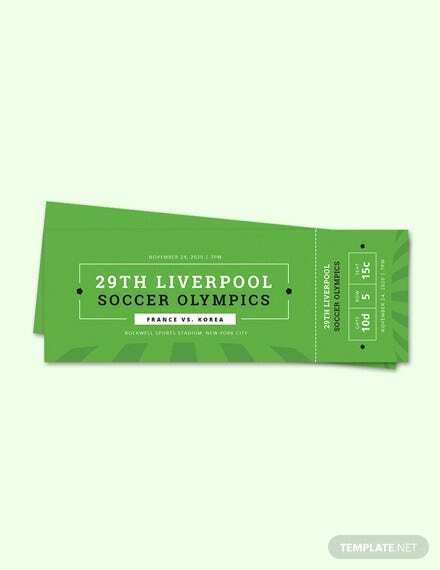 Let’s get the ball rolling—no pun intended—with this vibrant and creative sports ticket template. 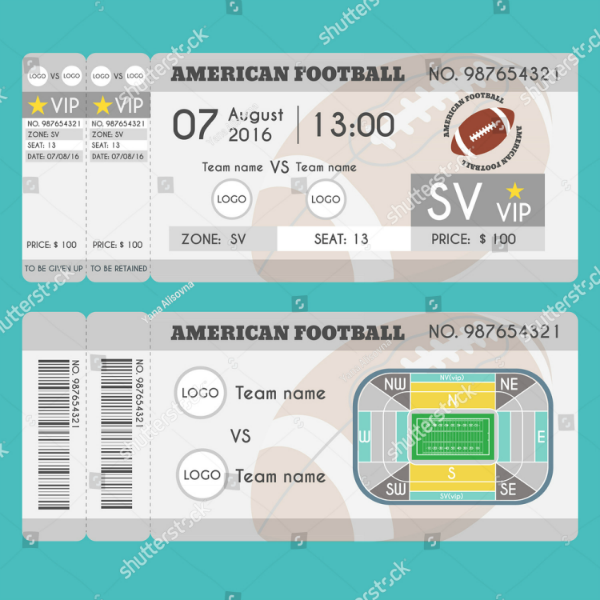 This template comes in two colorful designs that you can use either individually or as a back-to-back design for the ticket. Whatever event you’re planning, this would be a good choice, but if you want to look at the other designs, feel free to do so. Planning to incorporate a sports theme to your wedding event? 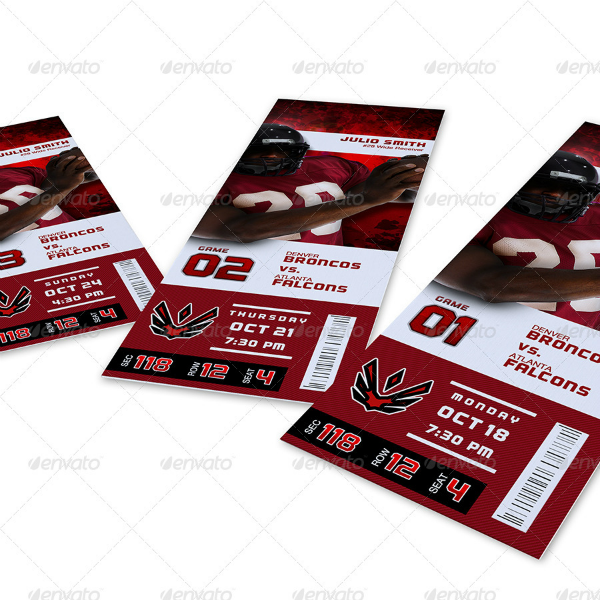 The ticket template above would be the perfect choice since it accurately resembles actual football tickets. The color scheme on this template can be easily edited, and you can change it to match either the colors of your favorite team or the motif of the wedding. 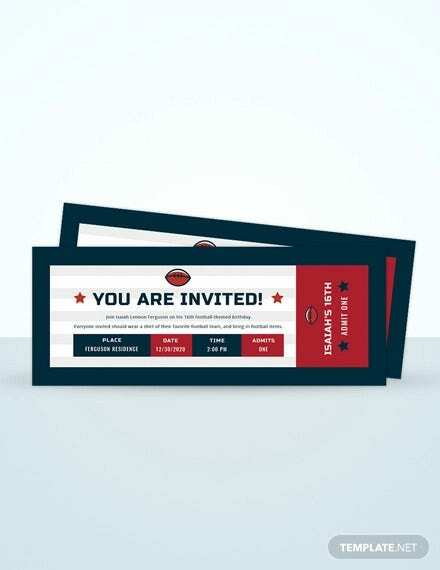 Here’s a vintage-inspired party ticket templates that you may also be interested, and this template comes in four formats that you can choose from. Whether you have Photoshop or Illustrator installed on your system, you’ll be able to use this template because it will let you choose whether to download it in PSD, AI, EPS, or ID. Also included in this template are seven fonts that you can use for free. People love watching sports regardless if they even know how to play that sport in the first place. Yes, they might have a clue on how the game works, but knowing how to actually play the game is different than simply knowing the rules. The point is people love to watch live sports and are usually very willing to spend money on sports tickets. But in order to really get your tickets sold, there are a few things that you will need to consider. You can also read wedding ticket invitation. Time is no longer a factor, people can buy tickets any time at any day of the week. Also, people are able to buy tickets regardless of where they are, all they need is a mobile device and an internet connection. The more tickets are sold early, the more resources you’ll have prior to the event. The reason why this is beneficial is because it can enable you to make last minute enhancements or additional advertising for the event. You can also read create tickets for events. Also, the more tickets sold online could mean a fewer number of staff needed in ticketing kiosks or outlets. And, since online tickets will have to be printed by the purchaser themselves, it can help you save on your printing expenses. You may also check musical concert tickets. Putting together a college football tournament? Here’s the perfect template that you can use for making your event tickets. In order to get the most from this template, have it printed on a glossy paper stock and make sure to print in the highest quality. Also, this template comes in PSD format, so make sure to have Adobe Photoshop ready on your system to be able to edit the design easily. In connection to the first tip, give discounts or rewards to those who will purchase tickets during the pre-selling period. This will further entice people into buying tickets early, some would even want to buy tickets in bulk just so they can take advantage of those discounts. Obviously, doing this can greatly help in boosting your ticket sales. You can also read concert ticket templates. When people learn of an upcoming sports event, they will have tons of questions ranging from when and who’s playing to where it’s going to be held. Instead of letting people wait for each time your advertisement is being broadcast, why not provide them with something that they can look into themselves. Of course, this comes in the form of a website, and it should be smart, catchy, and user-friendly. It is always best to have others help you out in spreading the word about the sports event and promoting the tickets than to do them all by yourselves. This way, the news will be able to travel faster and in multiple directions, covering a wider range of audiences. Another good strategy that you can do here is to offer freebies or a commission to those who are able to help in selling the tickets. You may also see dinner ticket templates. It makes perfect sense when a baby’s first birthday is being celebrated extravagantly than the other birthdays, and it is because it celebrates their first ever year of being born into the world. 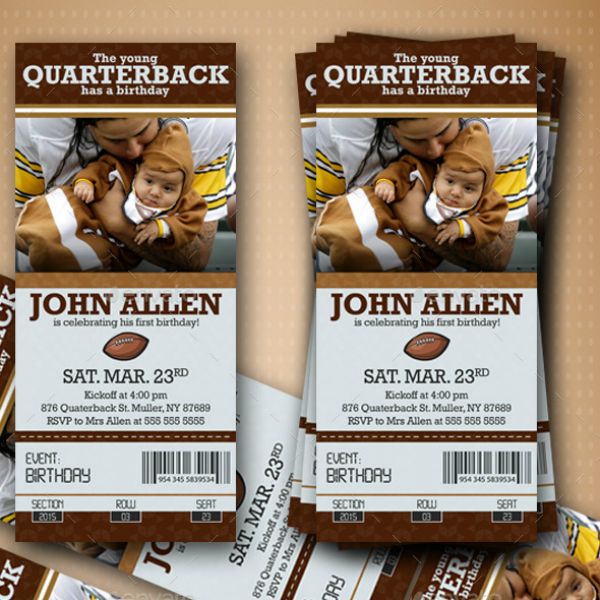 Whether you are actually a football player or just a fan, you may want to use the ticket template above for making birthday ticket invitations for your baby who’s turning one. Do you know that the American football field has a measurement of 110 meters by 48.76 meters, or 120 yards by 53.33 yards? We gave you that information because the printable ticket template shown above actually illustrates the football field complete with the side and goal lines. The text on this design are totally and easily editable for your convenience. 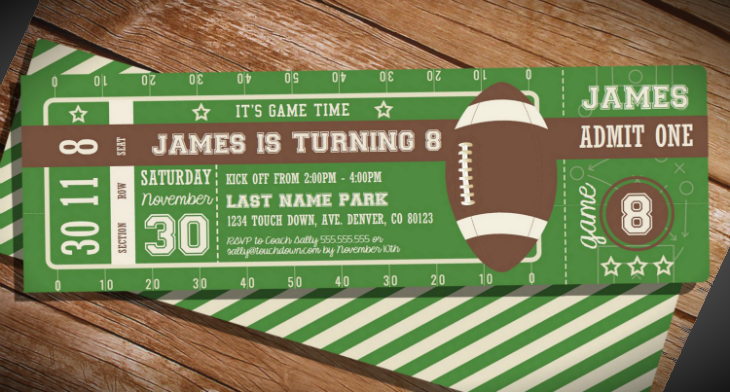 Here’s a birthday ticket invitation template that’s quite different than the others that you have just seen in this collection. The design on this template is watercolor-inspired and appears to have been hand-illustrated. Whether you’re planning a birthday party, baby shower, or any kind of party, this template would be a very good choice for making either tickets or invitations. As we have mentioned in the introduction, there are two versions of football, and in this article, we will be talking about the American version. This version—also referred to as gridiron football—is a sport that is played by two teams with eleven players over a rectangular field. This sport involves handling an oval-shaped ball and trying to get it to the end of the field in order to gain points. For the offensive team, they can carry the ball with their arms or they may also pass it around until it reaches the field goal. For the defensive team, on the other hand, they will need to stop the ball from advancing by way of tackling the person handling it. You may also read rugby game ticket templates. For each time that a person is able to bring the ball to the field goal, the team is rewarded six points, this is referred to as a touchdown. After which, the team that made the touchdown will be given a choice whether to kick the ball through the goal posts or to make an attempt at bringing the ball physically towards the goal, the former will be given one point while the latter is two points. Once the play is through for that team, the game will resume by having that team kick the ball towards the other side of the field for the opposing team to catch. You can also check out vintage event ticket templates. An entire football game lasts for a total of an hour in both professional and college play and are divided into four quarters of fifteen minutes. In high school football, their games last only forty-eight minutes with twelve minutes per quarter. There are several factors behind why football games last longer than their allotted times, and these factors are known as time stoppages. These time stoppages are being handled by an operator, which in turn, are based on the direction of an assigned official. Just like many other sports, the team with the most points at the end of the game is then declared the winner. You may also read jazz festival ticket template. 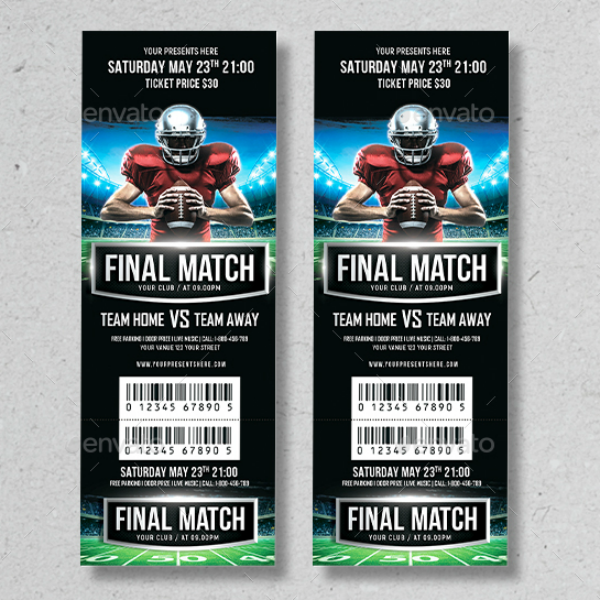 Here’s a simple yet creative football ticket template that you can use regardless of the type of event. The amazing thing about this template is that it allows you to use an image of your favorite football player. But if you want, you may also use a picture of yourself playing football. That way, the ticket will look a lot more personalized. You can also see ticket layout templates. 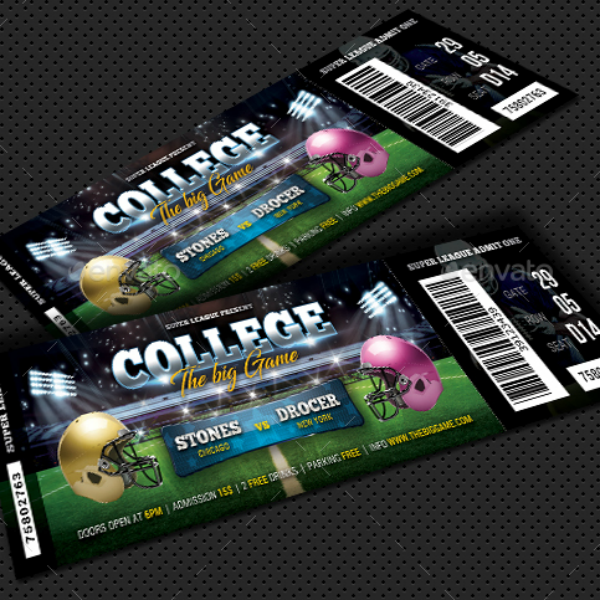 Did you like the football event ticket templates from this collection? Do you think you’ll be able to use these for an actual football event or any type event of event you have in mind that’s football-themed? We hope you have because it would be such a waste for you to leave here empty-handed. If you are indeed having second thoughts with regards to our templates, then allow us to explain why these templates are indeed worth downloading. 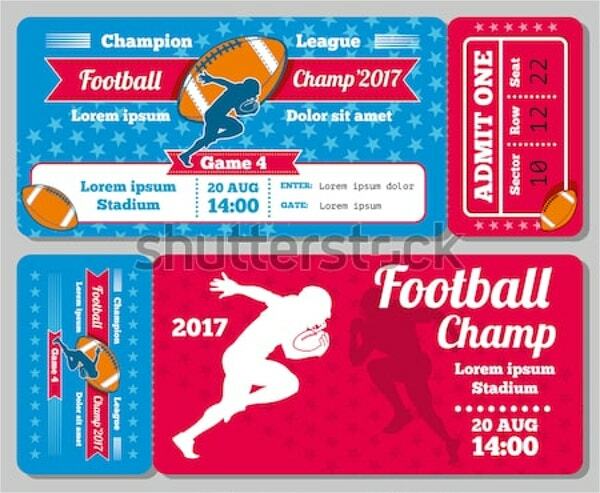 In terms of design, you can clearly see for yourself how well-designed these printable ticket templates are considering they were actually created by professional graphic artists. Other than that, these templates are also exceptionally high in quality which adds another reason why you should download them. If that still doesn’t sound convincing enough, what if we told that you can download any of these in all its glory for a very reasonable price? Now, are you convinced? If you are, go ahead and download a template now.